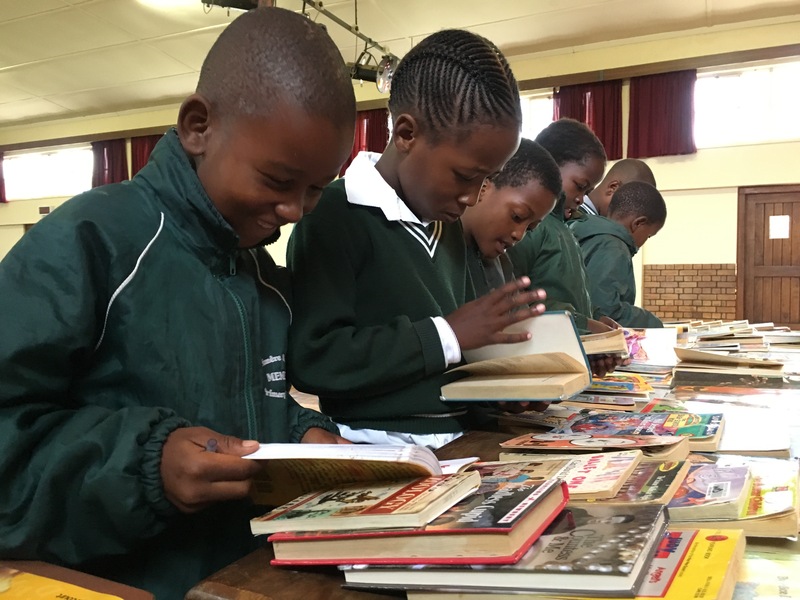 Through SheWinS, we maintain three public libraries in the Memel-Zamani community: one in Memel Primary School, one in Memel Public School, and one in Zamani Secondary School. Memel Primary School was our first library and now houses over 5,000 books, with the other two libraries each having about 800 books. The Memel Primary School library project began a few years ago, in collaboration with SheWinS. We wanted to aid the school in its educational mission and inspire a lifelong love of reading in the students. One of a kind, this is the largest library found in any public school in the Free State. The books are organized by reading level (beginning, intermediate, and advanced). Specialized subjects such as science, biography, and poetry are provided, and there is also a selection of books written in Zulu and on topics related to South African history. Students are permitted to check out one book at a time. The library is open two days a week – during the mid-day break and after school. We are constantly searching for and gathering new books to ensure that each student will ultimately have access to at least one book at a given time. That being said, our numbers have already exceeded expectations, which is something that we want to thank all of our donors for. Every contribution we have received adds to a growing world of opportunity, learning, imagination, and creativity for the children of Memel and Zamani. We can’t possibly thank our donors enough for the contribution they have made to this life-changing project. With generosity and consideration from enough individuals, we can gradually make those impediments a little less overwhelming. At a recent unveiling of new books, students were thrilled by what they discovered. We slowly brought the students into the library, classroom by classroom, to pique their interest and give them the opportunity to look at all of the different books. At first, the children entered the space rather timidly, unsure as to whether all of these books were actually for them or even whether it was okay to touch and pick them up. With just a few words of encouragement, they quickly spread throughout the room, their eyes darting each and every way trying to decide where to start. Some flipped pages hurriedly, anxious to take in as many of the illustrations as possible in the time that was given to them. Others turned the pages ever so slowly, their lips moving silently as they worked to form the words, their eyes progressively growing larger, hungrily absorbing every detail. Faces would break into limitless grins as children suddenly recognized a book or character and their friends gathered around to share in the thrilling discovery. Not only do these library books afford children the opportunity to immerse themselves in new and exciting worlds, but they also serve as invaluable resources to enhance the reading competency and earning potential of children who are fighting against insurmountable barriers in their day-to-day lives. In fact, a recent survey shows teachers have noticed a positive impact in students’ reading. The children have become more engaged and excited for library days, and there is noticeable improvement in spoken and written English by third grade. All the books are provided by donations from the Rotary Club in Johannesburg. Some come from private donors.